The mysterious volatility trader known as “50 Cent” has lost $US197 million in 2017 betting on a spike in the VIX, which would accompany a stock market shock. 50 Cent is starting to slow down, deploying roughly 20% of the contracts he had outstanding over the summer. The mysterious investor known as “50 Cent” has had a tough year betting on stock market turbulence – but it hasn’t been for a lack of trying. The trader has consistently purchased bite-sized chunks – usually costing around 50 cents – of options contracts betting on a spike in the the CBOE Volatility Index. Also known as the VIX, the gauge is a measure of expected price swings in US equities that serves as a barometer for investor nervousness. It generally climbs as stocks fall, so purchases of VIX contracts translate to bearish wagers on the S&P 500. On a year-to-date basis, that persistence has resulted in a whopping $US197 million mark-to-market loss for 50 Cent, according to data compiled by Macro Risk Advisors(MRA). The firm reports that the trader has spent a total of $US208 million on VIX bets, only to see the majority of them expire worthless. Macro Risk Advisors50 Cent has lost $US197 million on a mark-to-market basis betting on a volatility spike. MRA does note that 50 Cent’s volatility trading activity is likely some sort of broader portfolio hedge. By their calculation, the size of the trader’s actual market position is likely between $US20 billion to $US40 billion, assuming that the hedging premium paid represents 0.5% to 1% of total assets. 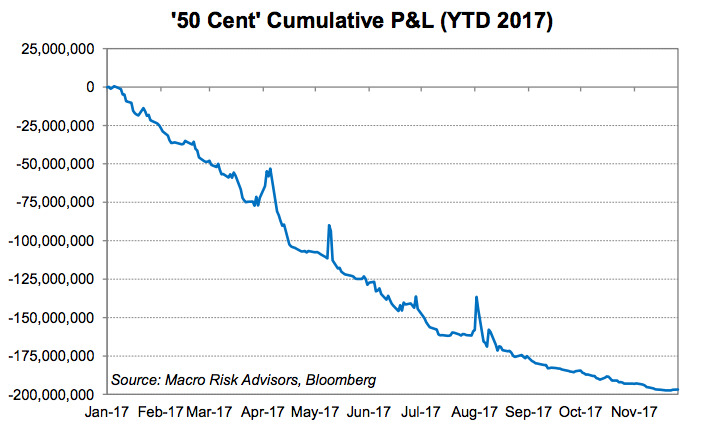 The firm also points out that, despite the dogged effort exhibited throughout 2017, 50 Cent seems to be losing steam. After reaching a maximum outstanding position of more than 1 million contracts over the summer, the infamous volatility vigilante currently only has about 200,000 in play, MRA says. 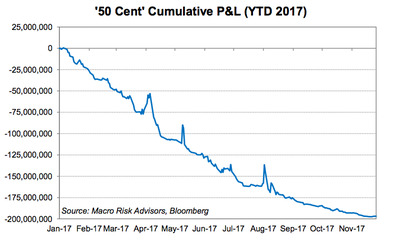 Macro Risk AdvisorsA visual representation of 50 Cent’s VIX futility in 2017. So with all of that established, who exactly is 50 Cent? The mystery behind the trader’s identity raged for months before the Financial Times blew the lid off the case back in May, citing four people from trading departments at banks who were familiar with the trades. They found that the volatility bull was none other than Ruffer LLP, a fund whose client roster includes the Church of England. 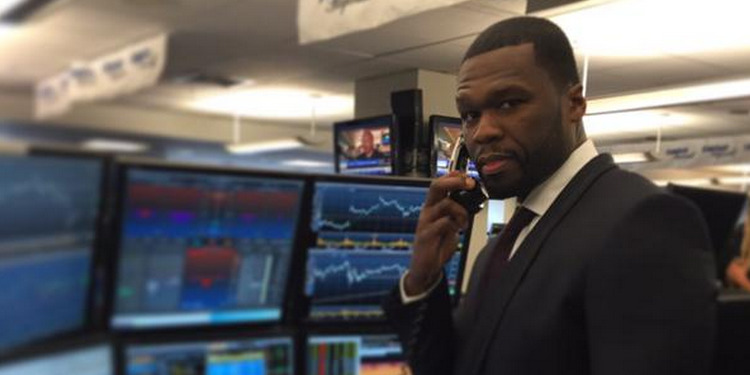 Now the question becomes, will 50 Cent continue betting on a stock market shock? After all, the VIX has ticked higher in recent weeks, climbing as much as 44% after hitting a record low in early November. Only time will tell. But it would be a shame to see 50 Cent throw in the towel now, after all he’s been through.